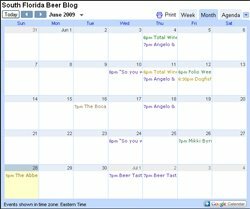 For the last four years the Jupiter Craft Brewers Festival has been THE beer festival in South Florida. This is the festival you want to go to if you are craft beer lover. With over 100 craft beers from some of the best breweries in the country this is the fest they pull the stops out for. If you are hoping to go to a beer fest and find rare or one of a kind beers this is the one you want to go to. The fest is being held this Saturday, January 29th from 1:00pm-5:30pm at Roger Dean Stadium in Jupiter. Online tickets are sold out so you'll want to get there early to get one of the 1600 tickets that will be available the day of. You won't want to miss out on this. Hope to see you there.